crafting with katie: MCT Cook-N-Craft! We have a new My Creative Time segment beginning today called Cook-N-Craft! We thought it would be fun to share what's cooking for dinner while we are doing our crafting! Hopefully we'll all get some new recipe ideas from each other. For my card today, I made something we all need this time of year: a thank you card. For this one, I used the Grainy Wood Background Stamp for my background, trimming it with one of the Stitched Rectangular Frame Dies. I then stamped the fun, whimsical flowers from the Build a Pretty Flower Stamp Set. 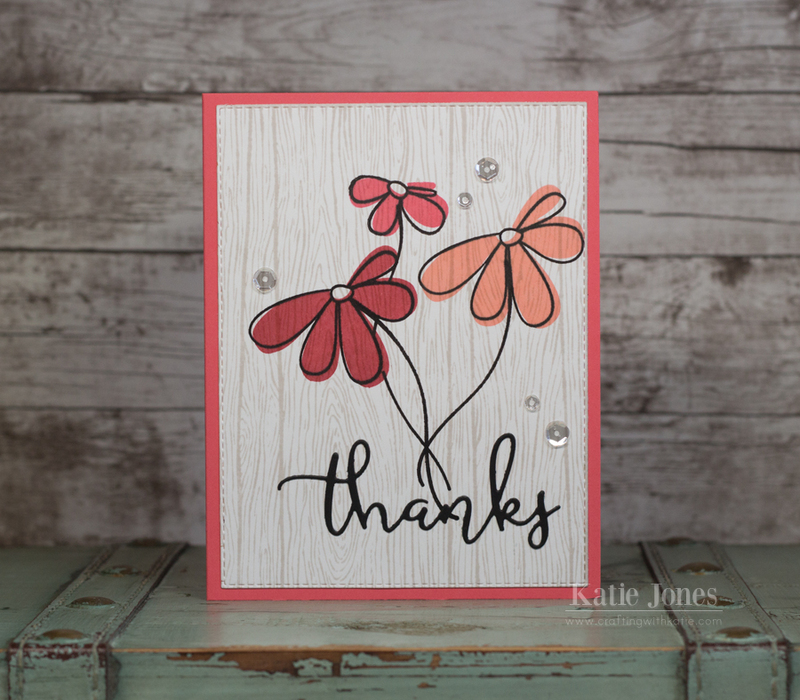 "Thanks" was made with a die from Thank You & Frame Dies. I finished off the card with some Pretty Pink Posh Sparkling Clear Sequins. 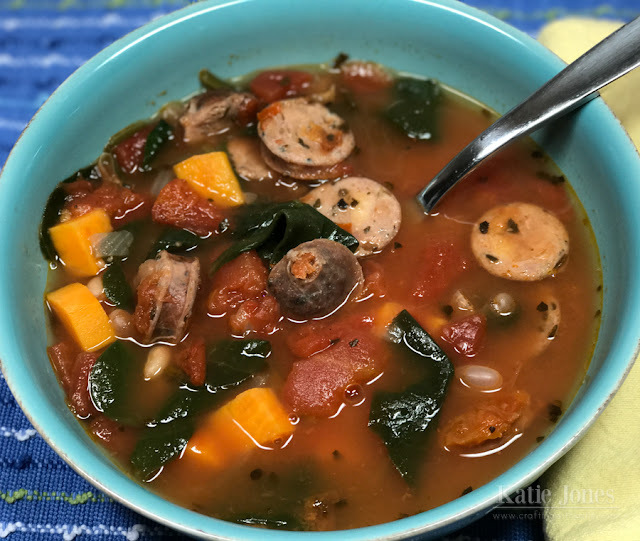 Now, for dinner, I made one of my favorite recipes: Sweet Potato Minestrone with Chicken Sausage. Last year I was getting my teeth cleaned when my dental hygienist starting telling me about this soup. It sounded so good, and she was sweet enough to write up the recipe for me while the dentist was checking my teeth! It's now a favorite in my household, and my mom and her friends make it all the time as well. Combine first 4 ingredients in a Dutch oven over medium-high heat; sauté 7 minutes or until sausage is browned. Add water and next 5 ingredients (water through beans). Bring to a boil; cover, reduce heat, and simmer 30 minutes or until vegetables are tender. Stir in spinach; cook an additional 2 minutes. What's cooking at your house today? If you'd like to share any recipes, I'd love to see them! I can't eat dairy anymore, so I'm always looking to build up my dairy-free recipe box! Oh My Goodness Miss Katey.....where do I begin...Ok 1st Beautiful card love your pretty flowers and wood grain background sure showcases them in one spectacular way. Great ideas the way you used Miss Emma's goodies. Ok...2nd..Your soup look so yummy...cute story share too!! I love soups so thanks for the share and wishing you a Very Happy, Healthy & Prosperous New Year. YOU so ROCK!! Such a pretty card and your soup looks so good. Thanks for sharing. I love how simple and pretty your card is! The font on the thanks die is so pretty also and the grainy wood background is perfect for so many cards...one of my favorites! I will be trying this soup for sure! It looks so yummy! darling card Katie! Your soup looks so good too, I'm going to try it next week! Katie - Love the card and the inspiration your blog provides in the midst of my busy days. Decided to try the recipe here and it is most delicious and easy! It makes a big pot of soup so my family is happily working our way to the bottom of pot. Thanks for the share and the story with it.